Do you remember that one episode of The Fairly OddParents where Timmy goes into the internet? I do, at least sort of. It was a good episode. 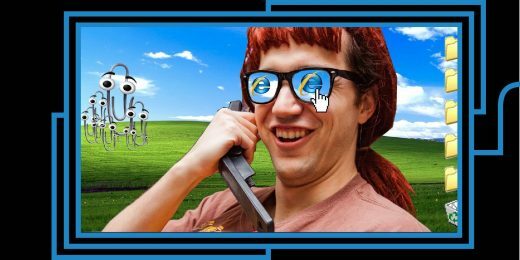 You could say he was an Internet Explorer, and well, the people on this comedy show are too. While they’re not family-friendly, fairy-filled cartoons, they have the passion and know-how to school you on all things Online. Yes, not only will a group of plugged-in comedians deliver lectures and demonstrations on algorithms, programming, and other STEM-y subjects, there will be some real live website-building happening. Audience members will give their best suggestions of what they envision a website to be, and then it shall happen before their very eyes. It’s implied the show’s creator Mark Vigeant has a penchant for old-school Geocities, so prepare to be reminded of the time you learned HTML not through Myspace like the cool kids, but because you wanted to make your Neopets profile the best it could be. Or maybe that’s just me. It is always nice to spend a night listening to people say genuinely funny things, and laughing at those funny things. Even if you have a really loud or weird-sounding laugh or shriek too much like I do sometimes, you should let yourself be free. Except, probably, if you’re a particularly rude heckler. Anyway, come as you are to Generous Laughs, a comedy show that will supply plenty of chuckle-worthy material in addition to smile-worthy philanthropy. Experience comedians both wonderful and strange, such as Cocoon Central Dance Team, Mitra Jouhari, Patti Harrison, Josh Sharp, Eudora Peterson, Julio Torres, Dylan Marron, and many others, who will bless you with their jokes in exchange for your money. This cash will then be donated to the Pride Fund To End Gun Violence, a PAC supporting candidates that value gun control and LGBTQ justice. So go ahead and shriek while you laugh, it’ll be for a good cause. According to its online tax return, the SPLC came into FY 2017 with $319 million in cash on hand, 98% of which was designated as “unrestricted” in use. According to Charity Navigator, donations to the SPLC for the first quarter of 2017 were up by 1400% over the previous year, or from $12.5 million to $187,500,000 for a single quarter. If that trend remained constant (and donations to the company only accelerated after the Charlottesville riots in August) the SPLC could be looking at a one Billion dollar donation year. In short, the SPLC doesn’t need the money at the moment. Your local food bank, women’s shelter, free medical clinic, even your local SPCA could do so much more with your gift. Give locally, where the need is greater and where you can see the results firsthand.